Wow! Today I had the lowest number of page views since I joined Hubpages 2 years ago. So apparently these changes have reduced my daily page views by more than 80%. I don't think I'll be writing any new hubs for a while. I'm investigating hosting my own blogs. I already have the server. Same here, earnings have dropped in the toilet due to the new layout. Yeah, my views haven't popped back up either. If you ignore all the Panda updates and the subdomain switch, the last time I had as little views as I do now was 2 years ago... when I didn't have half as many articles up as I do now. I've already mentioned in my last post on here that I won't write on here again until I'm back to the views I use to be getting. I've already moved some of my content to my own blogs, and deleted the hubs on here. Ship's a sinkin' and when my testing suggestions get the ever so famous HP response of "you guys can do that" it doesn't help keep me on board. I skimmed through this thread and didn't see my question - please forgive me if it's been asked already. When we "share" the page, will we have a "link to this page" option? Perhaps I've missed it somewhere...but I *love* using my referral tracker to share and link. Hey Hey Something New Again! Now its a central column (2/3 of the total width) with no foggy background images. Looks like it was designed for narrow screens 600x800. As my developer mate likes to say "you can't stop progress!" I just noticed that the recipe hubs no longer have that wide space empty on the right hand side. The text and everything else is now in the middle of the page with even borders on both sides. It was a pleasant surprise! I just found your hub on oven-roasted vegetables and was about to 'vote up', but couldn't find that facility. Has it gone? I think that the vote up button is now gone (on recipe hubs) but the others are still there. Possibly even more helpful is to give it a 5 star rating if you like what you see. Google sees that whereas I believe the vote up button was only for HP purposes. Thanks! I don't like this change. My Google Adsense earnings are down by 96%. Not good at all. Same here. Views are way down, nearly 50% for myself. I believe I will check on this blog hosting. Ditto, my Adsense earnings are down by about 50-60% on normal. I use the HP Ad program, but usually do okay on Adsense too, but now I am seeing a huge drop in earnings from it, which I suspect may be partly the new layouts and partly the fact HP are/were experimenting with turning Adsense Ads off on certain categories (as I understand it.) Overall my earnings are down now, which is frustrating when changing things like the layout back to how it was before is beyond my control. I seriously doubt the new layout is responsible for traffic fluctuations. The changes HP has implemented coincides with many changes Google is making - and those are affecting traffic. It will take time for the HP staff to analyze the Google changes and address them. As for the ads - I don't know what the new layout does to them, but I do believe HP will listen to the writers and not try to play games. The new layout is attractive, and if you look at many other content sites, you'll see a trend toward more 'white space.' Each site has to find ways to create a visual look that fits current reader preferences and at the same time find ways to maximize revenue. I love the new look, readers will actually feel like reading it now. The two large 'graphic' ads that used to be in the right column have gone. They used to pay for 'impressions' every time the page was opened - also gone. HP have claimed that the 3 ad blocks left (including the one above the title) will pay more than the 5 in the old layout. By the way the Google ad that pays directly to the author in the old layout is absent from the new layout ( all ad program if you opt for this). Of course HP wants to make money and so they are unlikely to shoot themselves in the foot - BUT the effect on traffic, reputation and earning with the never-ending experiment is unknown (5 weeks now for Fashion). Hard to see how its not hurting us. I agree. I do a lot of online research for my other work and many results or websites have at least 5 ads on the page result. So I wonder why HP has dropped the ads down by 2. The recipe format is quite plain, in my opinion, I just have a hard time believing a larger image and reduced ads are a progress. My traffic is down for sure; as my blogger accounts traffic is up. I am confused and concerned. This wave is a struggle to ride out for sure. I would like to see the avatars placed back on our hubs. My avatar is basically my logo, and I want it on my hubs. Readers may not remember my name, but I think there is a good chance they will remember my avatar. Why were avatars removed? Forgive me if that has already been answered; I skimmed but didnt see it on any of this thread's many posts. Add a box at the top using a picture column? I'm not sure what you mean. Please give me the "for dummies" version, lol. Thanks, Brandon. Hmmmm... I'm also not sure that would look right. Also, unless the hub was about dogs, would Google see the photo as irrelevant? Can G "see" what our photos are and determine their relevance? I wonder what is the thinking behind removing avatars? Sorry if my questions and statements show my ignorance. I was trying to keep up with all the threads on the various layout changes, but by the time this one came out, I had reached my saturation point. As a result, I didn't follow this one and now don't have the time or patience to sift through all 13 pages. Thanks for filling me in on that one! I get the feeling that HP is trying to 'streamline' hubs so that the Hub loads quicker. They would want this to happen because apparently more readers are using 'mobile' devices these days. I'm just going with the flow and seeing what happens. This month my numbers are up a bit! OK, that makes sense, thanks. Still, I would like my (hopefully) recognizable logo on my hubs. I'm just more of a picture person, and I think my avatar is more memorable than my hubber name, which IMO is kinda crummy. I guess I goofed when I signed up, not realizing it could never be changed. Maybe I need to start over with a new account that has a more memorable name. I certainly don't disagree with you as I believe our avatar is part of our 'branding' and our 'brand' should be on each and every page that we publish! btw don't be too hard on your 'hubber' name, you have published quite a few hubs under that name and established it well here already! Were they causing problems of some kind?? I know HP has stopped listening, but I would like to make one final plea for a wider format. What this means is that less than half of the text extends to the full width. Mostly the width of the text column is 5 or 6 words, which is very tiresome to read. Surely it would be better to move the 'right column' over allowing more width for the text. The blank area to the right just looks silly - a design error. It's probably a good look for mobile. 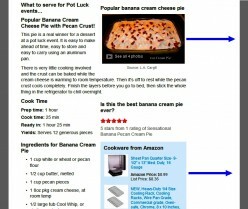 Adapting pages for mobile use is a big deal for many sites, including facebook. We are still listening. There will be more tweaks coming to the design in the coming weeks. We are still collecting data and doing user studies. One of the most interesting things we've seen is that food is behaving differently than tech and fashion. So, we are trying to understand these subtle, but important differences. These experiments are becoming a "never ending saga - like the TV series 'Lost'" - Fashion has been in re-design mode now for 6 weeks. How about telling us when it will end. I, for one, have cut back the writing because the experiment is damaging my earnings, traffic and reputation. HP traffic data is also on a steady slide - the never-ending experiment can't be helping. Please! - when will 'the coming weeks' END. Its our live hubs you are experimenting with. What are the projected benefits? Paul, you are being vague. So how is food "behaving differently"??? Do you suggest that we move away from writing and publishing recipes? I received that impression from a site other than HubPages. I doubt there's anything negative about recipes on HubPages. Even after being exposed to seemingly millions, I still click on original-titled ones. Especially recipes from Asia. My guess is that since the June contest is for recipes, that recipes hubs must be doing well. However, I only have a couple recipe hubs myself, so I wouldn't really know. Just fishing, Jason Marovich. Thank you for your comment. I was trying my luck at another site and turned in a recipe. The person in charge leaned towards recipes going the wayside and suggested that I write about anything but cooking and baking. I cook, but I am always on the prowl for recipes. I have to agree with janderson99. How long can we be kept in the dark about the "new and improved" HubPages? I have Hubs to be published, but have set them aside. I am enjoying my time off from here. Maybe way too much. All I can say is that I am in hot pursuit of other things--like my retired self should be doing, anyway. It's only money, right? The last thing you want to do is screw with anyone's income. Makes for some unhappy sheep. If HubPages is doing what people are saying facebook should be doing, I'd take that as a sign that your developers and programmers are top notch. Hang in there, I am, too. right on sister!!! Right on. I do believe that HP will figure it out; as if we are not making money; it goes for them too Right? You may have top notch developers and programmers at HubPages, but anyone who has ever been a boss or a supervisor can easily tell you this right off: If you do not inform your people about what you are doing when it comes to major changes involving them and their income, they will automatically feel left out because they did not have a hand in the decision making. They will feel like they have been played. "More tweaks in the next coming weeks." Yet, another version of "As the Stomach Turns" or "Promises, Promises" where we all lose! I'm looking at future trends concerning recipes and other subjects, k. Unlike my friend Jenubouka, who is a trained chef, I am simply a home cook. If the online trend is more towards the professional chef writing recipes and reviews, I will bow out gracefully and concentrate on something else to write. As far as Hub recipe layout goes, those glaring big blocks of white space are a distraction to the reader as well as a loss of income for most writers. Online contests are not an indication of what topics are wanted and needed online. Contests are merely a way to get people to write. Trust me, I am no fan of these new layouts from a visual standpoint whatsoever. I shiver every time I see that background on the tech hubs and the way the recipe hubs have the social share buttons on the right making the whole hub just look askew drives me nuts. Visually, I definitely prefer balance and symmetry and these new layouts have neither and actually really turn me off from a reading standpoint. I don't even enjoy looking through the comments as it is just text on top of text. I really hope the avatars make their way back. What I meant about the recipe contest, was that perhaps it is somehow indicative of how the new food layout is performing from a monetary standpoint. I'm guessing HP wouldn't "promote" it to us writers via a contest if the layout flopped in whatever their tests are - just speculation on my part though. The text in hubs using the recipe capsule gets scrambled when there are images etc. in the right column. The ingredients look silly on two lines. That white column on the right is there to accommodate the social buttons that are sticky and move with the page. But visually they take up too much precious content real estate in my opinion, forcing the rest to just look too crammed and off center. I wish they would move the social buttons outside of the rectangular content area and have them stick out to one side (sort of the way a tab on a manila folder looks - if you know what I mean). I like the static social share buttons on the right instead of moving down the hub. The more I look at the new layout, the more cluttered the old layout looks. And it does load faster. I would still like to see more noticeable vote/accolade buttons and the comment section does look a little sparse. I don't feel as inclined to read the comments with the new layout. I don't have any recipe hubs, but I have a couple Fashion/Beauty hubs. I just checked out a recipe hub by MissOlive on fruit smoothies, and I think it looks great, plus it sounds delicious. I'm with you, janderson99. The trout are biting, so it's time to split this dog and pony show for now. Someone kindly wake me up when this is all over. I didn't think it would drag out this long--and then some! I really appreciate the questions. We are doing a very data driven process with the goal of increasing the readers satisfaction, engagement, seo and monetization. Food is a highly competitive category with different traffic trends, engagement rates and ad performance. The in page 250x250 ad slot didnt see the same monetization improvements that tech and fashion saw. We are making many subtle changes every week. I saw some comps last week with elements that should be tested in the coming weeks. We also want this design to go through a panda update to see how the test subdomains perform as well as the categories. We hope this happens by the end of the month. These are very important tests, so we arent going to rush them out till the data is clear - we are anxious to get through this as well. We are also working a new testing system for monetization on the new design that will use a smaller set of impressions and allow for more tests. The first goal was to make the ads perform as well as the current design. In the near future we believe that we can make the new layout perform much better. The engineering for this system starts this week. Going to be a big week. Hmm sounds good. I don't have any recipe hubs so I have absolutely no clue as to how they're performing. I'll just have to wait this one out. Thank you! Now you are talking, Paul. If food articles are so highly competitive now, I will find somewhere else to land. I will write about other things. This is all I wanted to know, so now we're getting somewhere. I do question if there is a future in recipes because they are everywhere. I am a rank amateur when it comes to cooking and baking, so I will leave it to the experts--the professionally trained chefs like Jenubouka. I am on a medical diet, and realize the importance of good, healthy recipes for my family and friends. I certainly am not doing anyone any favors with my high-calorie, unhealthy recipes, so I leave the recipe publishing to the experts. I hope you finally give these writers a recipe layout to showcase their hard work. Go with the flow, especially during the ebb.